Final preparations are underway for one of the Rio Grande Valley’s largest annual community festivals on Saturday. Workers are putting the finishing touches to floats, playgrounds and food vending sites in Mission for the Texas Citrus Fiesta. The parade is scheduled to begin at 3 p.m. According to Texas Citrus Fiesta board member, Nora Hinojosa, more than 150,000 people are expected to attend the annual event. The citrus industry in the Rio Grande Valley was still young when Mission resident Paul Ord and the Young Men’s Business League organized the first Texas Citrus Fiesta in 1932. The celebration was seen as a way of promoting the winter harvest of grapefruits and oranges in the Valley. Each year, royalty reigns supreme over the festival. Eighty-seven years later, the selection of the Texas Citrus Fiesta queen takes center stage during the events leading up to the parade. According to veteran dressmaker, Delfina Rios, outfitting a Citrianna can cost as much as $1,500 to $5,000, depending on the materials and fabric. Five judges interview the 16-year-old contestants, also known as duchesses, who are asked about the history of the citrus industry and about themselves, extra-curricular activities and their goals in life. The festival also showcases industries found in nearby Valley cities. Hinojosa said vendors from San Isidro, Roma and South Padre Island will be represented at the festival. About 35 floats are will take part in the fiesta parade. For weeks, workers have been decorating the floats and other vehicles that will be a central focus of the festival. According to Hinojosa, work on the floats won’t end until Friday night. 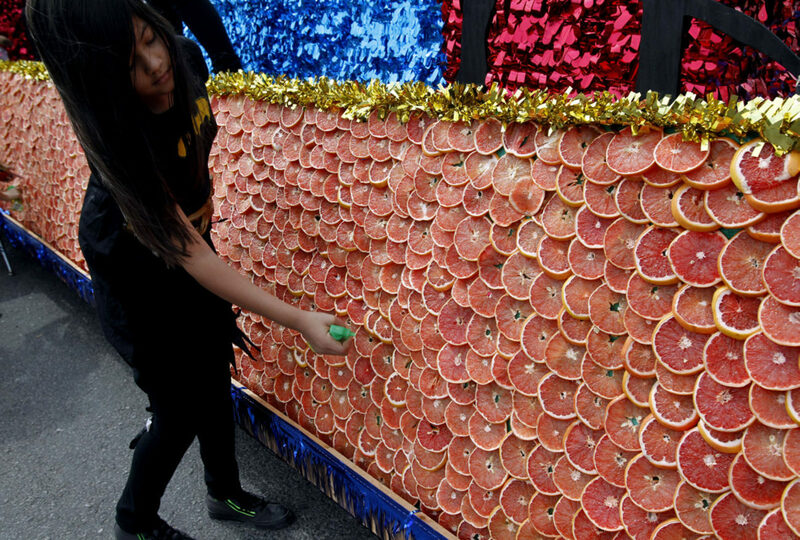 “That’s when workers will pick fruit to decorate the floats so the fruit will be fresh,” said Hinojosa. Another major attraction Saturday will be the Fun Fair. Saturday’s parade route runs from Mission’s north to south sides. “We line-up from 2 Mile Line and North Conway Avenue. The parade will start exactly on Griffin Parkway, which is FM 495, and they will go south on Conway, ending on First Street,” said Hinojosa. But the fiesta’s biggest attraction is that the day-long event is free and family friendly.